Armed with a Top 15 single at Active Rock and Mainstream Rock radio, just named YouTube’s “Artist On The Rise” for the band’s gritty and infectious debut track “Highway Tune” (more than 400,000 plays since mid-April), and a group conviction to bring rock’n’roll back to the mainstream, red-hot breaking band Greta Van Fleet announces a three-week, U.S. headline tour starting August 15 in Columbus, Ohio. In addition to these tour dates, the band – brothers Josh (vocals), Jake (guitars), and Sam Kiszka (bass, keyboards) and close friend Danny Wagner (drums) – will play a special Los Angeles performance (open to the public) at The Viper Room on Tuesday, July 25. The full itinerary is below, and tickets are on sale now. 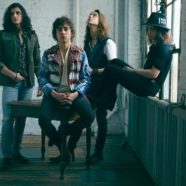 Go to gretavanfleet.com for all ticketing details.